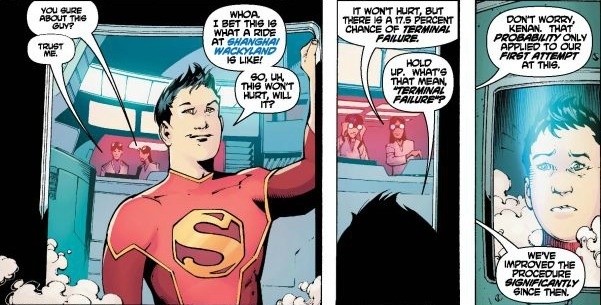 A New Super-Man #1 Review – What’s the Point? At face value, a book about a Chinese Superman is not only intriguing, but a PR gold mine in a company (and an industry at large) aching for diversity. New Super-Man inherently calls for something different. A Superman who looks different, a different city, a different culture, etc. Otherwise, what’s the point? Somebody needs to answer that question. At this point, it’s not apparent what they’re trying to give us outside of another run-of-the-mill superhero book. Kong Kenan is a teenage bully who becomes a viral video sensation for throwing a soda can at a supervillain. Soon after, he is made the subject of a lab experiment that grants him the same powers as Superman. But Kong Kenan is not Clark Kent. So what does a young Chinese man with a social activist for a father, but also a penchant for bullying, do with the same abilities as the Man of Steel? 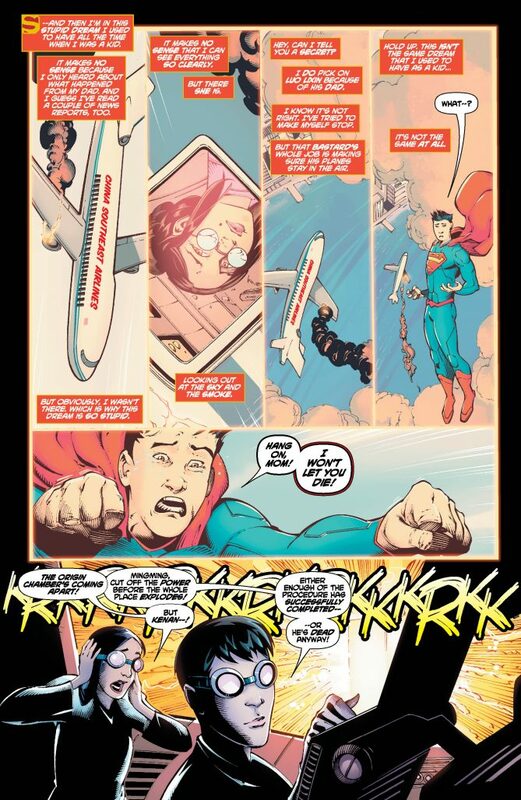 Gene Luen Yang started writing Superman at a bad time. The whole Truth storyline falls squarely into the “Things That Could Have Been Awesome” category. What made it all the more disappointing is that Yang is an excellent writer, perhaps best known for his original graphic novel, American Born Chinese. With that in mind, a story like this seems like it would be a lay up for him. Seeing him turn in a dud like this is very deflating. 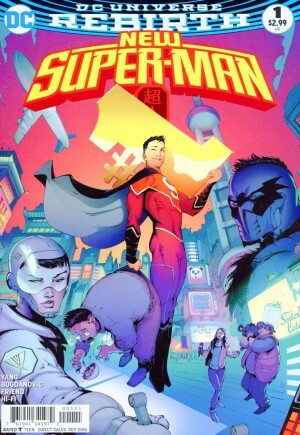 Perhaps this was naive or unfair, but I was hoping New Super-Man could provide an alternate perspective on the American superhero story through the prism of Chinese culture. A Chinese twist on an American icon. With American Born Chinese, Yang’s main character was so empathetic. The book allows those with no knowledge of Chinese culture to learn bit, and to see American culture from a new perspective. There isn’t any of that in New Super-Man. Granted, we’re only one issue in. But there’s no unique hook in this issue to bring me back next month. You could set this series in the United States and it would more or less be the same. It’s stunning how big a disappointment this is. Victor Bogdanovic does fine here. His somewhat cartoony take on things characterizes everybody pretty quickly in a shallow, caricaturesque sort of way. Kenan is something of a goof, but there’s a heart of gold in there somewhere. And apparently he’s hung up on his mother’s death. We’ve got our vibrant and aggressive Lois Lane stand-in with Laney Lan, and the grouchy buzzkill in his father. There’s nothing with any sort of depth here. But at least it’s fun to look at. New Super-Man #1 let me down more than any single issue has in quite some time. The ironic thing? There’s precious little that’s new or interesting about what we see here. Considering DC is starting fresh with so many of its books, that’s a damn near fatal flaw. Especially for a new series. Barring some sort of radical twist, I won’t be coming back to this one. This entry was posted in Wrestling and tagged American Born Chinese, China, Chinese Superman, comic book reviews, comic books, DC Comics, Gene Luen Yang, Kong Kenan, New Super-Man, Rob Siebert, single issue reviews, superhero comics, superheroes, Superman, The Final Days of Superman, Victor Bodganovic on 07/20/2016 by primaryignition.